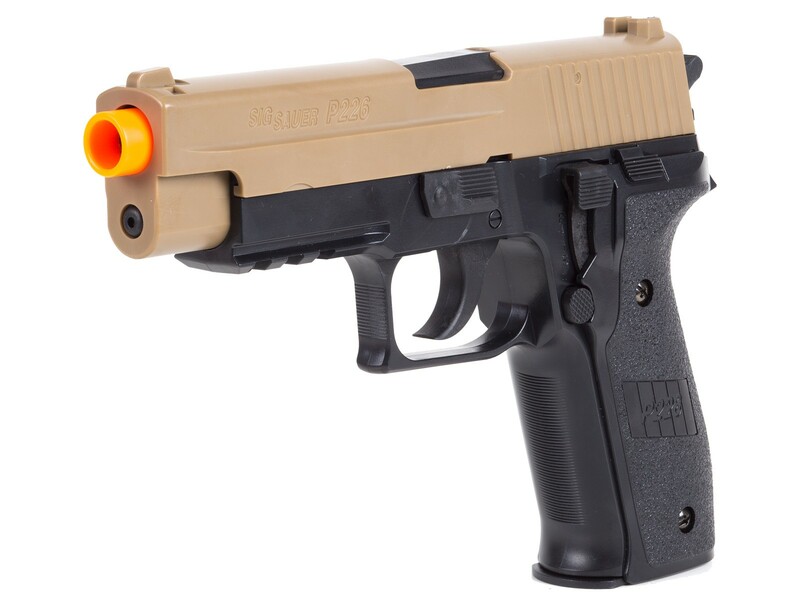 Jump into a world of airsoft fun with the SIG Sauer P226 airsoft pistol! 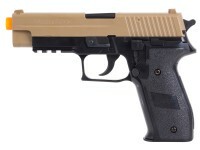 Used by Navy Seals and British Armed Forces, this airsoft variant features a unique 2 tone black and tan color scheme. 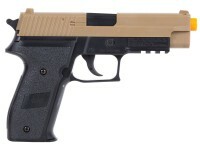 The 226 features a high capacity 50 round magazine lets you shoot every time you rack the slide, and sends them at your airsoft opponents at speeds up to 300 fps. 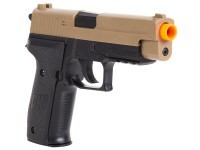 Each 226 includes an adjustable BAX shooting system to adjust the distance of your shots while keeping them accurate. Additionally, you can mount your own choice of a laser or flashlight to the Weaver/Picatinny accessory rail for the optimal tactical experience. 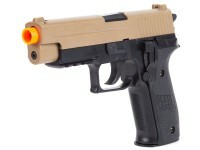 All these features add up to a gun that’s a fun choice for a sidearm in intense airsoft skirmishes. So rack one into the chamber and hit the battlefield! Things I liked: Lightweight. Ease of loading and love the tan. Black look. Things I liked: The accuracy is excellent! Things I would have changed: The safety stinks. Its more or less irrelevant. Difficult to turn off or on. What others should know: 20grams are the PERFECT size bb. Any larger is too big and lighter isnt accurate.